The F-35A Joint Strike Fighter, christened the Lightning II, offers the pilot next-generation situational awareness from sensor fusion. Advanced sensor fusion gives F-35 operators full knowledge of their environment. Pilots flying the new F-35 strike fighter may be forgiven if they begin to believe that their aircraft is disappearing around them: Its sensor suite, situational awareness and human-machine interface are so advanced that the pilot will have instantaneous knowledge of everything around him or her—in all directions. In an aircraft with displays that resemble video games more than conventional cockpits, pilots will have a greater variety of situational awareness information and more capabilities to act on that information than available on any other aircraft currently flying. These informational assets include awareness of other nearby aircraft and their identities as well as of which enemy targets are being engaged by friendly fliers. The pilot can tailor the cockpit’s wide-screen visual display to present a number of different situational awareness readouts and sensor views. In effect, the F-35 pilot is his or her own chief information officer, or CIO. Training for the next generation of strike pilots may not begin on Cessnas but instead on Pentiums. The F-35 is being developed jointly by the United States and the United Kingdom. Lockheed Martin is the prime contractor, and other major contractors include Northrop Grumman and BAE Systems. The aircraft can fly at speeds greater than Mach 1.5 without afterburners, and it incorporates stealth designs as effectively as previous-generation dedicated stealth aircraft. The aircraft comes in three major variants. The F-35A Lightning II is designed for the U.S. Air Force and the Royal Air Force. It includes an internal gun mount for close-in air-to-air combat. The F-35B is a short takeoff, vertical landing (STOVL) aircraft intended for use by the U.S. Marines and the Royal Marines. It includes a three-bearing swivel exhaust nozzle and a separate shaft-driven, ambient-air lift fan just behind the pilot. The F-35C, which has a larger wing area and tail section than the other two variants, is designed for the U.S. Navy and the Royal Navy. It is specifically configured for aircraft carrier operations. Between just the United States and the United Kingdom, the F-35 has program of record orders for more than 2,500 aircraft. The F-35 program has aimed to maximize commonality among all three aircraft, emphasizes Robert L. Rubino, an F-35 program director in the Washington, D.C., office of Lockheed Martin. The avionics are 100 percent common among the three, as are the weapons capabilities. He declares that the program will be able to meet each service’s unique requirements while remaining affordable. The program has enlisted eight more international partners that have contributed $4.5 billion to development costs of about $40 billion. In turn, they have participated in design reviews and have been eligible to receive contracts for design and construction of the aircraft. Rubino relates that these international contracts are awarded on the basis of best value with no consideration given to the amount of money contributed to the program by any country. Nonetheless, companies in the partner nations have received contracts that exceed the total of their nation’s investments. In turn, the aircraft has received the best value technologies and systems available among the participating countries, he states. This approach is evident in the aircraft’s pilot-machine interface. The helmet system is built by Vision Systems International LLC, based in San José, California. Known as VSI, the company is a joint venture between Rockwell Collins and EFW Incorporated. EFW, based in Fort Worth, Texas, is an Elbit Systems of America company wholly owned by Elbit Systems Ltd. of Israel. 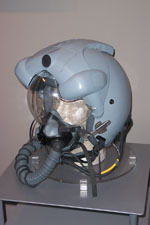 This helmet system is at the heart of the aircraft’s control and situational awareness system. With the F-35’s helmet-mounted display, the traditional head-up display is eliminated completely. The pilot has a multisensor view of the surroundings that is not inhibited by weather, darkness or even the body of the aircraft itself. The F-35 is designed with open-architecture mission systems that feature information fusion. It has no stovepipes, Rubino declares. All of the aircraft’s information is fused through one integrated core processor that can combine data from radar, infrared and electro-optic sensors. This processor can perform more than 1 trillion computations per second, and the pilot can tailor the fused information from the aircraft’s integrated sensor suite to whatever form best suits a situation. And, this fused situational awareness picture is not limited to input from onboard systems. Pilots can include information from Airborne Warning and Control System (AWACS) and Joint Surveillance Target Attack Radar System (JointSTARS) aircraft, among many air- and land-based platforms. The flip side is that the F-35 also can serve as an intelligence collection platform. Its Link-16 datalink system allows it to downlink vital intelligence, surveillance and reconnaissance (ISR) information to other platforms and headquarters, including space-based assets. A prognostic health and management system allows the aircraft to downlink mechanical issues automatically to its base as it returns from a mission. All told, the aircraft has more than 120 information exchange requirements ranging from fellow fighter aircraft to ships and ground-based vehicles, Rubino relates. This permits the aircraft to feed ISR data to weapon systems such as a Patriot missile battery. The aircraft also will be compatible with future systems such as the Joint Tactical Radio System, or JTRS, and the Army’s Future Combat Systems. The F-35 has its own unique datalink system—the multi-array downlink, or MADL. It is a low-probability-of-intercept/low-probability-of-detection point-to-point datalink. It permits rapid exchange of diverse information with other F-35s at fairly long ranges, Rubino allows, and this provides greater flexibility for conducting operations. For example, one F-35 could be flying with all of its active sensors in full roar collecting information and building a complete picture for another F-35 operating in a silent stealth mode. The MADL would allow the active F-35 to transfer the fused information to its silent partner some distance away. The aircraft’s main radar is an active electronically scanned array radar with multiple air-to-air, air-to-ground and situational awareness modes. Known as the APG-81, it is built by Northrop Grumman. More than 1,000 scanning arrays can independently track ground and air targets almost simultaneously, Rubino notes. A ground moving target detector picks up objects in motion on the ground, and the radar also can detect unmanned combat air vehicles or cruise missiles. The radar can serve as a receiver as well. For example, it can collect a lot of data where a JointSTARS cannot go because of the threat environment. This constitutes nontraditional ISR, Rubino allows. A synthetic aperture radar system generates imagery that resembles a visible light black-and-white photograph. A pilot can activate a high-resolution zoom function that does not require the system to rebuild the entire image. “The fidelity of the pictures that we get from the synthetic aperture radar gives us a true all-weather day-or-night capability,” Rubino declares. The F-35’s electro-optical targeting system, or EOTS, is built by Lockheed Martin. It is based on Lockheed’s Sniper technology and is packaged in a small unit encased in sapphire glass protruding just under the aircraft’s nose. Unlike previous electro-optical targeting systems, the single-aperture EOTS does not take up a weapon station, Rubino points out. EOTS can detect laser spots on ground targets, and it can perform its own laser designation and ranging using a diode-pumped eyesafe laser. For air-to-air targeting, it employs forward-looking infrared. It also has its own integrated infrared search and track capability for long-range airborne objects. The F-35’s helmet (t) features a display system (b) that eliminates the conventional head-up display. But the aircraft’s key sensor system may be the distributed aperture system, or DAS, which is built by Northrop Grumman. The skin of the aircraft is ringed with six infrared DAS sensors at the tip of each axis. They generate a full 360-degree spherical view from the pilot’s perspective. Unlike the pilot’s own eyesight, however, the infrared system can see through clouds and into the night, so the pilot has an unobstructed view of his or her surroundings. It also can track a wingman automatically and display its position. Rubino explains that DAS was designed primarily as a missile-launch detector. It can pick up the plume of a surface-to-air or surface-to-surface missile. The system places an identification icon on the missile so that the pilot can find it. But DAS has other capabilities. It can track every aircraft within 10 miles of the F-35. 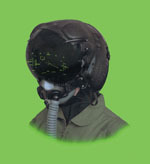 And, DAS data can be displayed on the pilot’s helmet-mounted display system. Its coverage is seamless, so as the pilot turns his or her head, DAS follows that motion and provides a smooth panoramic view of the surroundings. The pilot sees no seam during handoff from one sensor to another, and latency is not a problem. With DAS providing 360-degree spherical coverage, the pilot’s-eye view is directionally unlimited. If that pilot looks down at his or her feet, he or she will see what is directly under the aircraft. In effect, DAS makes the floor of the aircraft disappear. This capability is especially useful in the STOVL version of the F-35 when a pilot is landing vertically. For all F-35 variants, it improves night flight and landing operations considerably. With all of these sensor systems networked seamlessly, the pilot does not even have to turn his or her head to know where an enemy aircraft is. When an adversary in a head-on engagement flies past the pilot to behind the F-35, the sensor suite continues to track the enemy on the pilot’s display. There is no blind spot. The F-35 pilot knows the location of every aircraft in the vicinity. In addition to the helmet-mounted display, the pilot has a much more comprehensive display in front. Instead of multiple instruments and displays, the F-35 has a single large touchscreen that can be subdivided into any of a number of different displays. This touchscreen also is voice activated, so the pilot can change navigational functions or radio frequencies without lifting a finger. The giant screen actually comprises a pair of 8 x 10 screens, each of which runs on independent electrical systems to improve survivability. The F-35 has a backup system with an electrical flight instrument system, or EFIS, that runs off a battery. Each of the two screens has two portals, and each portal has two subportals. A pilot can put any of the aircraft’s menus—instruments, vehicle systems, weapons—on the screen. This permits the pilot to expand a display while maintaining access to the two subportals. A status bar across the top of the big screen provides administrative information such as fuel amount, engine performance, weapon loads and flight control systems at a glance. A touch expands the display to provide more information about a particular system. The pilot can program the aircraft’s radios through the display by mixing and matching up to three different frequencies. Rubino relates that a pilot will program much of the aircraft before ever stepping into the cockpit. For example, the pilot can program a fence checklist for actions to be taken when the aircraft enters hostile airspace. This checklist serves as more than a reminder, however. It will activate designated systems automatically when the aircraft reaches the fence point, which is the point during a mission when certain systems must be activated. Only the aircraft’s master arm toggle requires manual activation. Pilots testing F-35 simulators generally have preferred to have the aircraft’s tactical situation display (TSD) presented on one screen, Rubino relates. He describes this display as “the God’s eye view” of the aircraft’s situational awareness system. Pilots can program any of the three TSDs to fuse all information or break it down into different elements. The TSD comes with a cursor that the pilot manipulates from the left-hand (throttle) control. The pilot places the cursor on air or ground target icons for identification or target designation. After placing the cursor, the pilot can zoom in on an icon or a group of icons, and the display will show an arc that reports the position of the zoomed-in targets relative to the aircraft—4 o’clock, 10 o’clock or 2 o’clock, for example. A numerical readout gives the range—the display also informs the pilot of whether the target is within range of the aircraft’s weapons—and the targets are differentiated by circles for air targets and triangles for ground targets. The display also shows the time to release and the time to target. Placing the cursor over an air target icon opens a dialogue box that suggests an identity for the target along with its degree of confidence. It also names the systems or sensors that are providing the information, which includes speed and altitude. Then the pilot designates the target by rocking a target management switch with one finger, which places a red circle around the icon under the cursor. This is where the MADL comes in. The flight leader can opt for another F-35 to take on this designated target. This leader assigns the target to the wingman, who receives an audio message in his or her helmet along with a visual assignment cue in the helmet-mounted display. The display can show a small air-to-air shootlist that indicates which friendly aircraft are targeting which hostile counterparts. The same assignment capability can be used for air-to-ground targeting. An aircraft identified as a hostile target is displayed with a small line extending toward the F-35’s icon. This line represents the range of the enemy aircraft’s air-to-air weaponry. As long as the F-35 pilot stays outside the reach of that line, the hostile aircraft cannot shoot it down—and some of the F-35’s air-to-air weapons have longer ranges and can take out the enemy aircraft at that safe distance. Not all of the F-35’s cues are visual. A three-dimensional audio system gives the pilot a sense of direction when hearing an alarm. For example, when a radar warning receiver goes off, the pilot will hear that sound from the direction of the threat. The F-35A has four internal weapon stations. It can carry two air-to-air missiles and two air-to-ground weapons internally or four air-to-air missiles internally. A four-pack of small diameter bombs can be fit on one internal station. If the aircraft does not need to operate in a stealth mode, it can carry more than 18,000 pounds of munitions internally and externally. Each wing has three hard points, one of which is an outboard AIM-9X or advanced short-range air-to-air missile station. F-35 initial operating capability will be with the Marine Corps in 2012. The F-35A Lightning II will achieve initial operating capability with the Air Force in 2013.